If you frequent forums, exhibitions, clubs – in short, if you socialise in any way whatsoever within the hobby – then you will be familiar with this comment. You may have even made it yourself. I know I have thought it, if not said it out loud. Whilst I agree that many things seem daunting at first, and that this can be a valid initial reaction, I have to say that the phrase is poppycock! Put another way, if you have decided that you will fail, then fail you will, but if you are determined, then you will succeed. I have a favourite quote from the wonderful Jane Goodall, “If you really want something, and really work hard, and take advantage of opportunities, and never give up, you will find a way.” And that is what this post is about – wanting something enough. There are a few, very few, modellers who seem to just get things right from day one, in the same way that some people can just pick up a musical instrument and play – I am thinking of the Mozarts and Hendrixes of this world. For the rest of us, we have to work hard. Not every musician can play by ear, even those who make a living from it. Francis Rossi of the Status Quo practices scales on his guitar for two hours a day, to make sure he doesn’t lose his touch. Roger Daltry tells a story about the first time he saw Jimi Hendrix, in the company of Eric Clapton (messrs Daltry and Clapton are both railway modellers, by the way). On the way back from the gig, Clapton apparently murmured that he was going to go home and practice some more. Daltry’s comment on this is, “I’d hate to be a guitarist.” And that’s the point: it takes work, even if you have talent, to be really, really good. And although, as anyone who has played one will agree, an expensive, quality guitar is easier to play, you don’t need an expensive tool of the trade to start with. Pete Townsend leanred to play on a cheap guitar, using a old sixpence coin as a plectrum, and ultimately learned to play on just two strings as he couldn’t afford new ones when the others broke. In short, he learned to use what he had to hone his own abilities because he wanted to get better at playing the guitar. It took me 15 years of half-hearted practicing to get to a point where I was happy with my own playing. Most people who play tend to do this rather more quickly, as they are rather more driven than I was, but the point is that it took time, effort and practice. I am not talking about being good enough to play on the stadium circuit, just good enough for me to feel comfortable (I have played in a couple of pubs, way back when – way back when I was awful!) I also worked my way through various guitars, culminating in one which I obtained at a considerable discount as it was shop-soiled (it had fallen off the display rack!) I mention this as it is frequently possible to buy a decent machine tool second-hand for less than the cost of something new but not as good. Iain Rice has made reference to his early years, with a loco repainted with “yard-high lettering”, and an amusing aside that we have all got to start somewhere. 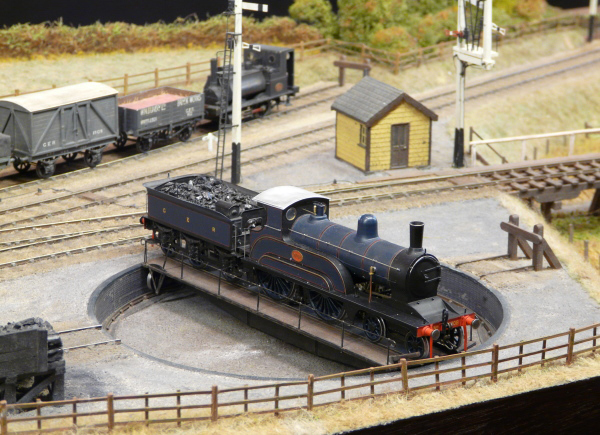 My good friend Trevor Nunn, whom I would dub the “compleat railway modeller”, builds virtually everything himself, with many of the castings he used having been produced from his own patterns. But he didn’t start out scratch building locos with working inside motion. No, he started out as a teenager with a simple Stewart-Reidpath kit, which he modified to look similar to a Midland and Great Northern Joint Railway 0-6-0 tank loco. During the sixties, he started to build whitemtal kits and modify ready to run locomotives to represent other classes, such as converting a Triang M7 into an LNER G5. The Bury St. Edmunds club members frequently benefitted from this (he was heavily involved with them at the time, including designing the Abbotsford terminus) and as he improved his skills, confidence and familiarity with tools and materials, he progressed to scratchbuilding. His remarkable finescale 00 models of an LNER E4 2-4-0 and B1 4-6-0 now belong to Ray Hammond – who was also a member of the same club (along with, at various times, other noted luminaries as Jas Millham and Barry Norman – what a club!) He was about to embark on a model of the LMS Ivatt 2MT 2-6-0 when he came across S scale in the early 70s – by this time he was in his mid-30s – but for many years he had only two Great Eastern Railway locos of his own: a G15 (LNER Y6) 0-4-0T tram loco, based around a Triang motor bogie with body of metal and wood, and a 209 class (LNER Y9) 0-4-0ST. The Wicken branch’s staple loco, the E22 (J65) 0-6-0T did not appear until 1980, and the next loco, an E10 class 0-4-4T, was started in 1982 but took 9 years to complete. Since then, he has built two new layouts including the buildings and track, coaching stock, wagon stock, and many new engines, but the point is that he wasn’t born able to do this. Although I think he is blessed with an innate ability to handle a file well (which I would rate as the most important skill to have) he had to serve his time and put in his modelling apprenticeship, interrupted as it was by National Service, starting a career, getting married, starting a family, etc. These didn’t just absorb time, they absorb money, so he learned to make do, and to make. But this wasn’t an “overnight success” story, although I think all would agree that it was a success. It took many years. And at the end of this period, he felt confident to tackle new projects, to push his own boundaries. As an example, when he built his G16 4-4-0, he was aware that the high-pitched boiler left a rather obvious visible space between the frames, a space which on the real thing was filled with piston rods, slide bars, connecting rods and Joy’s valve motion. He had never done this before, and did contemplate having dummy, non-working, motion. Thankfully this contemplation was brief, and he resolved to have a go, and make it work. It took a surprising amount of time to get all the required details together, but the finished model is a work of engineering art, and the motion a joy to behold (see what I did there?) with links moving above and below the plate frames. Since then, of course, more locomotives have been built with working inside motion, and Trevor has come to the conclusion that with Stephenson link motion, the movement is so small and subtle that whilst it is worth making the connecting rods, etc, move, the actual valve gear could be static. One problem now remains – what of the older engines, built before he decided to try pushing his boundaries? Well, some of them would benefit from the addition of extra detail, for example the above mentioned E22 tank loco would benefit from some slide-bars filling out the space, some from moving motion, and others such as the E10 and his D27 2-2-2 single wheeler have things like sandboxes and splashers positioned such that nothing is required (given the drive arrangements, this is a good thing, as it would an interesting technical challenge!) And by the way, the locos have split-axle pickup, with all metal wheels using lost-wax brass castings for the centres, turned to fit into steel tyres which are profiled on the lathe. Apart from the actual casting process, all of this – including making the patterns – is done by Trevor himself: when he had built up enough skill and confidence, and not before, he bought himself a lathe, and taught himself how to use it. And this takes us back to the title: instant gratification. It is a sad observation of modern life, but as we have become more affluent as a society, we seem to have developed a desire to purchase, rather than to make – to buy things ready-made, rather than to buy the tools to make things, and to expect everything to be right. In short, we look for instant results, and instant gratification. I have found that generally speaking, instant gratification only lasts for an instant, and that for anything to be valued, it needs to come as the result of hard work. And the longer that takes, frequently the greater the personal satisfaction, which is much, much better than gratification. So, to be good takes time. And effort. And determination. And care. And for most of us, starting off with a basic toolkit, and with simple techniques is the start of this. Replacing moulded details such as handrails with wire is a great start: sadly the manufacturers often do this for us now (but sometimes the effect is a bit heavy and overscale and therefore it is worth doing it yourself). So is upgrading components, for example with “after market” parts, or making a few pieces yourself. Moving on, good kits are a great thing (I learned a lot about North American freight cars from building PRS boxcar kits) and then one can look at modifying RTR and kits into new variants. Beyond that, scratchbuilding calls, and the world is the mollusc of one’s choice. But it won’t happen overnight. It takes time, and effort. But it is massively rewarding: something you can only find out by having a go. This entry was posted in Modelling, Opinions on April 30, 2013 by Simon.